So this post is coming to you very late but I figured better late than never! 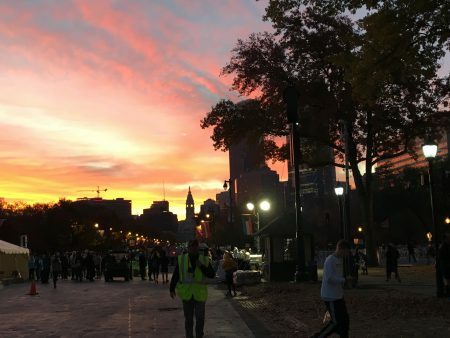 I wasn’t sure how I’d feel about going to Philly after having to downgrade from the marathon to the half, but with train tickets booked and time requested off from work, I was determined to have a good time. My mom and I traveled down by train on Friday afternoon. It was an easy and comfortable trip and once we got to Philadelphia, we took a cab right over to the expo. It was a little bigger than I expected but well organized and I was quickly able to grab my number and shirt. We didn’t spend too much time shopping around the expo since I wanted to limit the swag purchasing. That evening, we checked into our Airbnb with some takeout hamburgers from Spot Gourmet Burgers. If you are ever in the Philly area, I highly recommend as this burger might have been the best burger I’ve ever eaten. We had a very low key evening, watching some Netflix and going to bed early since the half marathon was on Saturday (the full was on Sunday). The next day I woke up early and Ubered down to the start which was only a mile and a half or so from our Airbnb. I had heard the security lines could get long for this race so I showed up an hour early. There were hardly any other runners there at this point! It was a pretty cold morning and I hadn’t brought any layers since my mom was was going to bring my bag at the finish so I didn’t love having to wait so long in the cold to get going. But, I suppose it’s better than running late. At least I got an awesome view of the sunrise! 15 minutes or so before the start, I headed into my corral. 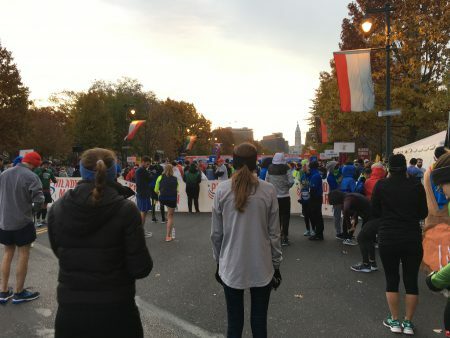 It was not crazy packed like the NYC Marathon gets which I was extremely grateful for. 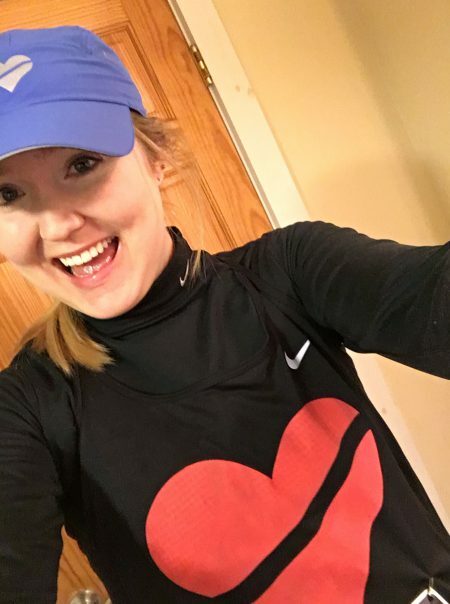 I was wearing my Heartbreaker (that is the name of my Boston run club) singlet and within five minutes of being in the corral, another Heartbreaker said hello! (if you’re reading this, hi Sarah!) After chatting for a few minutes, it sounded like we had similar pace goals in mind so we decided to run together for the first few miles. I’m not sure why, but looking back at my splits for the race, the first six miles fluctuate between around 8:30/mile pace and low 8s. Truthfully, this was a little faster than I had really intended to go, but once I was running I felt great and decided to just roll with it. At mile 6, I said goodbye to Sarah and made plans to meet up for a photo at the finish. Then I decided to push the pace a little more. This stretch had great support. There was cheering, signs, marching bands playing drums – it was an incredible atmosphere. I definitely got a little swept up in it all and ended up running a 7:43 for that mile. From there, I backed off a little bit back to my marathon pace, right around 8:00/mile. There was a bit of a hill at Mile 9 but I felt strong and didn’t get intimidated by it. I hit Mile 9 in 8:05 and Mile 10 in 8:10. From there, I could tell I still had plenty of gas still in the tank so I decided it was go-time. There’s nothing I love more than being able to pick it up and pass tons of people at the end of the race. I’ve had races where I’ve had injuries act up which have kept me slow and races where I’ve just died in the final miles and it’s given me such a deep appreciation for that feeling of strength at the end of the race because it doesn’t always happen. I hit Mile 12 in 7:33. At this time, I started to get a stomach cramp which hardly ever happens for me, but it did force me to slow down a bit, running Mile 13 in 7:45. By my GPS watch, I ran a 1:46:57 with an 8:03/mile average pace. I was absolutely stoked about this. For one, this is only a couple minutes off my PR and I felt like I was running really easy in the beginning. Two, this is right where I need to be for my marathon pace in February. February 25th is still a long ways away and I’ve learned not to overly fixate on a goal race because who the hell knows what will happen with injuries and whatnot, but I will say I’m cautiously excited. I know postponing my marathon was the right decision and it will be fun to see how it pays off. 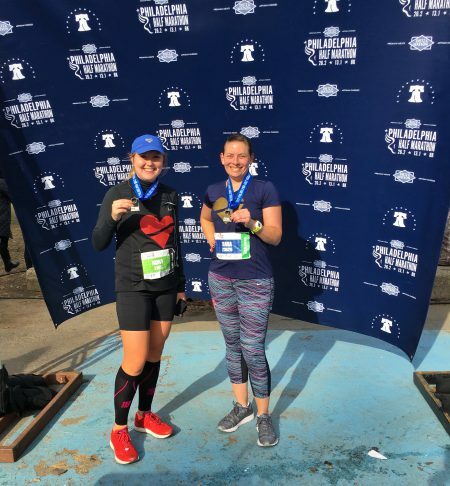 This entry was posted in Races and tagged Marathon, Philadelphia Half Marathon, Philly Half, Race Recap, Race Review. Bookmark the permalink. That’s a great pace. That’s about where my 5K pace is but I need to get the longer runs down there!